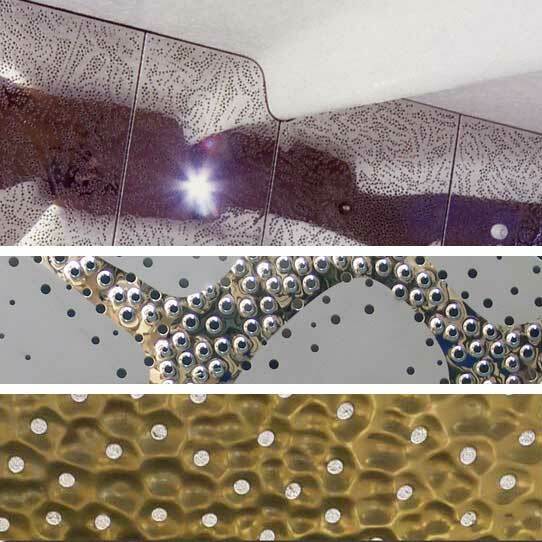 For decorative or functional requirements EXYD develops and produces nonlinear pattern perforation. The perforation patterns can be developed on a desired theme or based on illustration material provided by the customer, or correspond to embossed shapes. The perforation patterns can be free cross-section, restricted to certain areas, continuous, diffuse or covering the entire surface. Computer programs developed by EXYD are used to generate the perforation patterns. The specially developed generation programs make it easier to both implement the customer's wishes in terms of design and meet the technical requirements.